× 9 = seventy two Required Please enter the correct value. Earlier this month JPMorgan Chase & Co. (NYSE: JPM) chief executive officer Jamie Dimon told USA Today that, "We have seen the worst. We are at the bottom. We may hug along the bottom for a while, but we are at the bottom." But a home price bottom doesn't mean a rebound just yet. Increased U.S. home sales are a sign that home price declines will slow and eventually flatten in 2012. The National Association of Realtors reported existing-home sales in December rose 5% to a seasonally adjusted rate of 4.61 million. There were 3.6% more sales completed than in December 2010, and completed sales were 1.7% higher for all of 2011 compared to 2010. "Encouraging precursors to a true stabilization of home values are falling into place as the new year begins," Dr. Stan Humphries, chief economist for real estate information company Zillow Inc. (Nasdaq: Z), told Forbes. "Home sales will show a more consistent upward trend this year, slowly reducing the amount of vacant housing inventory. This increased demand will eventually start to put a floor under home values later this year." 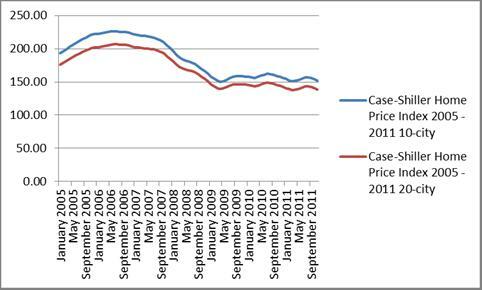 While prices will stabilize, it's likely more small declines will persist in 2012 before an upward trend takes hold. "When people phrase is that way, they say 'we've reached the bottom.' That suggests that we have the expectation of a major turning point right now. But I don't see that," Robert Shiller, Yale professor and one of the economists who created the Case-Shiller Home Price Index, said in an interview with Business Insider editor Henry Blodgett. "I don't see any reason to think that prices are going to start heading up dramatically now." Strong upward price movements aren't expected for at least another couple years. The likeliest outcome is the Case-Shiller Home Price Index shows sideways price movement, that only rises and falls in a small margin for the rest of 2012. With Existing-Home Sales On The Rise, Could Wall Street Be Right About Housing?